Oh So Arty was founded in Tel Aviv and so it will always have a special place in our hearts. This coastal metropolis boasts the best of both worlds offering a bustling city life balanced with the calm beauty of the Mediterranean seaside. Founded in just 1909, Tel Aviv is still a young city that has carved out a space for itself as the country’s bohemian center offering the best in technology and culture. This Spring Tel Aviv has become a destination for people from all over the world as it hosts the Eurovision song contest in May and celebrates 100 years of the Bauhaus school. There is no better way to experience the diverse art scene in Tel Aviv than on one of our gallery or street art tours which explore the evolving identity of the city. Keep reading for the best ways to spend 72 hours in Tel Aviv or book an art tour here. An Oh So Arty tour at Miriam Cabess’a Tel Aviv studio. When it comes to finding suitable lodgings in Tel Aviv there are a bevy of expertly designed boutique hotels that offer luxurious amenities and comforts. The Hotel Montefiore and Hotel Nordoy make our list for unique boutique hotels options. The renowned brunch at the Hotel Montefiore is a must for all travellers to the city whether staying there or not. Innovative takes on culinary staples such as toasted challah bread are not to be missed. While The Hotel Nordoy centrally located near the Nachlat Binyamin weekly craft market offers a first rate spa experience. Treat yourself to a luxurious massage on the hotel’s panoramic rooftop! If you prefer to stay in Jaffa we cannot recommend The Setai enough. This luxurious new complex offers rooftop pool and unbeatable views of the sea. Hotel Montefiore. Photo by Sivan Askayo. Having settled on your ideal home base it’s time to explore the city by foot or by cycle! One of the best ways to spend an afternoon in Tel Aviv is by leisurely strolling its verdant boulevards, stopping by the cute kiosks for a coffee and taking in the fabulous Bauhaus architecture. Often referred to as The White City Tel Aviv has the largest number of Bauhaus buildings in the world making a UNESCO World Heritage Site. For architecture aficionados we recommend a visit to the Bauhaus Center Tel Aviv to explore their permanent collection dedicated to the subject. The Hotel Nordoy. Photo by Assaf Pinchuk. Take advantage of the local designers available in the city. One of our favorite boutiques is Aviva Zilberman located in a chic storefront in central Tel Aviv. Also be sure to check out Hibino for interior options, Maria Berman for timeless fashion looks, and Greek Sandals Official for the best shoes around. There are many fantastic culinary offerings in Tel Aviv. For Thursday nights we recommend dinner at famed Israeli chef Eyal Shani’s restaurant North Abraxas. Known for his unique twists on vegetables, Shani’s restaurants are favorites among locals. Make sure to order the cauliflower to experience one of Shani’s most revered dishes! Close out the night with drinks at Nilus. 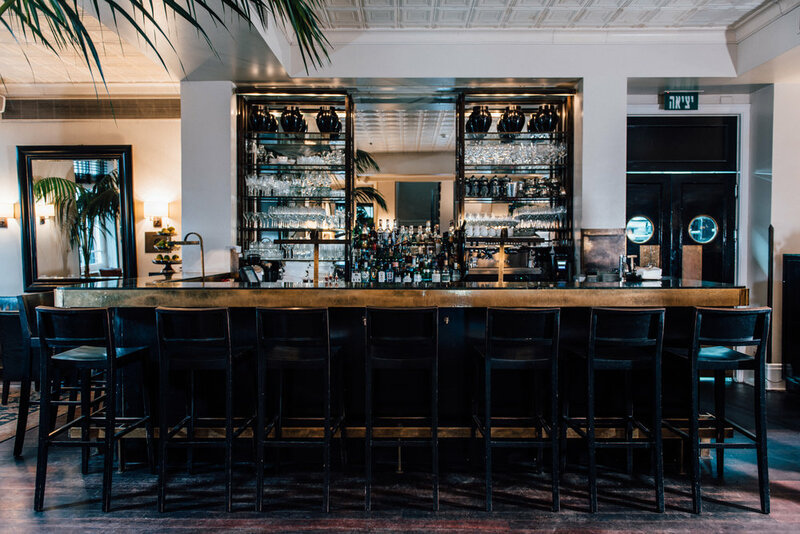 This stylish bar is located in an old hotel and radiates a timeless energy. Aviva Zilberman boutique located at 23 Meltchet street. Friday mornings are best spent grabbing hummus and soaking up the Middle Eastern vibes offered at the Carmel Market. Start your morning with some classic Israeli cuisine and great coffee at Yom Tov Cafe and get ready to explore the city’s art scene. The Tel Aviv Museum of Art is the best place to discover Israeli art history. The new building designed by Preston Scott Cohen is a real gem and offers a strong overview of art from Israel. If you’re looking to immerse yourself in the city’s contemporary art scene you have to head to the southern areas of Tel Aviv where most of the galleries have relocated in past years. The South of Tel Aviv has many industrial spaces and where most galleries are located today, due to relatively cheap rents, proximity to the artists’ studios and suitable spaces. We love to frequent Dvir Gallery, Alon Segev Gallery and Rosenfeld Contemporary Art for their unique roster of artists and intriguing exhibition programming. You’ll probably find yourself totally enamored of the Israeli art scene and it’s never been easier to collect artwork by contemporary artists from Israel! Art Source is an online platform (founded by two local art professionals- Michal Freedman and Oh So Arty founder Sarah Peguine) for discovering the best Israeli artists and collecting their work. Visit the Art Source website, read the online magazine and follow their Instagram page to learn more! Rosenfeld Contemporary Art. Photo by Sophie Weinstein. Teder is an awesome bar and online radio station that also serves up generously sized pizzas. If you’re looking for more food just head upstairs to Romano, another Eyal Shani restaurant. On Friday nights they push the tables back and local DJ’s spin until the early hours of Saturday morning. Romano. Photo by Ariel Efron. In Tel Aviv Saturdays are all about the beach. Tel Avivians love living along the sea and on weekends they flock to the long coastline to recharge before the week ahead! Start your Saturday morning slowly with a stroll through Neve Tzedek, a quaint neighborhood with French influence boasting charming cafes and boutiques. Then make your way to Old Jaffa for one our favorite beaches and a fresh juice at one of the many juice stalls located in the Shuk Hapishpeshim. The Jaffa art scene also has a lot to offer in terms of contemporary art with the newly opened Magasin III and creative hub Beit Kandinoff. Complete your trip to Tel Aviv by booking a private art tour with Oh So Arty for an insider perspective on the White City. Sarah Peguine leading an art tour at Dvir Gallery. To book a private art tour in Tel Aviv please click here.